What a beautiful January day on the beach today. The tides were at their awkward phase for painting. Low tide was at 8:30 am and high tide was at 1:30pm. The tide, size of the waves, and the weather of course, determine what beach I go to paint on a given day. Some places, like Hug Point, are not accessible when the tide is coming in. 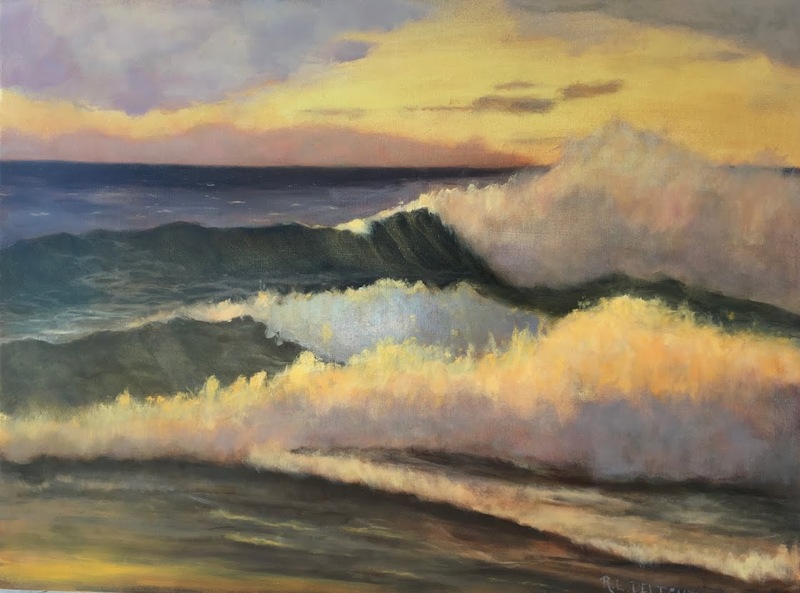 It was a perfect day to paint a wave study. 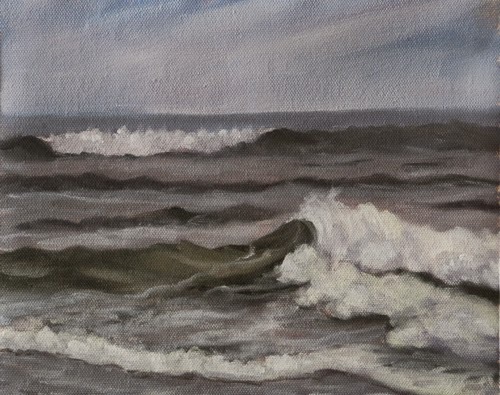 I like to paint wave studies when the tide is coming in. I went out to my home beach here in Manzanita/Neahkahnie this morning. I love painting on the north end next to Neahkahnie Mountain for several reasons. One is that the mountain is big enough to shelter me from most winds. Another reason is that I love the way the waves bounce off of Neahkahnie's toes and make cross waves. In stormy weather those waves are huge and rather spectacular. I have been trying to capture those cross waves en plein air for quite a while. I understand the mechanics of the cross waves from having watched them for the past 4 years. I struggle with getting the paint to depict them in all their glory. I am getting closer and after getting home and taking a good look at the painting, I understand a bit more. I am hoping to get out again tomorrow and put that understanding to the test. The light was beautiful, gauzy, opalescent, and elusive. Right after I finished packing up for the day, the sun came out and made everything sparkle. The winter sun on the northern Oregon coast is soft and somewhat rosy due to the low angle in the sky. It isn't a strong light but it can dazzle the eyes when you come around a curve in the road while driving. That low angle makes for interesting shadows too. I am getting closer to that 100th plein air wave study. It will be interesting to see the difference between this study and the 100th one. I already know there will be quite a difference between the first and the 100th one! Here are a few parting pictures of the day. Lovely study Renee, so different in colors and depth from the earlier ones in the numbered series! Thank you Theresa! I hope we get more storms too. It will be another dry year if we don't. I know I don't have to tell you that. Take care!